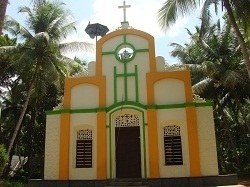 St. Joseph's Church, Kidarakuzhi belongs to the Diocese of Neyyatinkara. It is situated in the District of Trivandrum, about 15 kilometers away from Trivandrum Town. The parish has five substations- Holy Rosary Church, Payattuvila, Pius X Church, Mathapuram, Thekkuthery, Christ the King Church, Thennurkonam, St. Antony's Church Nettathani, and Infant Jesus Church, Panavila. There are two nursery schools belonging to the parish. The Vincentians took up this parish in the year 2006. Rev. Fr. Thankachan Chirayath CM was the First Vincentian Parish Priest. At Present, Fr. Joji Kizhukkarakattu CM is the Parish Priest and Fr. Tibin CM is the Assistant Parish Priest.